Enjoy these fun astronaut facts for kids. Learn how many people have been into outer space, who has spent the longest time in space, how many astronauts have been to the Moon, what it takes to become an astronaut and much more. An astronaut or cosmonaut is a person trained by a spaceflight program to lead, pilot or be a crew member of an expedition to space on a spacecraft. As well as being used to describe a professional space traveller, the term astronaut or cosmonaut is now often used for anyone who travels into space, such as scientists, politicians, journalists, and tourists. The World Air Sports Federation (FAI) recognizes only those flights that reach an altitude of more than 100 km (62 mi) as space flights. However, the USA awards astronaut wings to any astronauts who travel above 80 km (50 miles). The "edge of space" is scientifically accepted to be 100 km (62 mi) above sea level at the 'Karman line'. As of June 2013, a total of 532 people representing 36 nations have been above the Karman Line and therefore have reached outer space. 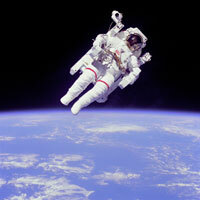 The term "astronaut” is derived from the Greek words astron, meaning "star", and nautes, meaning "sailor". An astronaut employed by the Russian Federal Space Agency is called a kosmonavt (cosmonaut in English), derived from the Greek words kosmos, meaning "universe", and nautes, meaning "sailor". The first person to reach space was Soviet, Yuri Gagarin, in 1961, on board the spacecraft Vostok 1, he orbited Earth for 108 minutes. The first woman in space was Soviet Valentina Tereshkova, in 1963. She orbited Earth for nearly 3 days aboard Vostok 6. Russian, Sergei Krikalev, has been to space 6 times including on two ISS expeditions and has spent a total of 803 days, 9 hours and 39 minutes (or 2.2 years) in space, more than any other human who has ever lived (as at 2013). 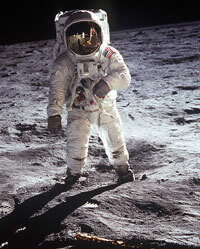 Including Neil Armstrong and Buzz Aldrin, 12 men have walked on the Moon, two from each of the six different Apollo missions. Cosmonaut Alexei Leonov was the first person to carry out an extra-vehicular activity (EVA) or a "spacewalk", on March 18, 1965, on the Voskhod 2 mission. Cosmonaut Anatoly Solovyev holds the record for the most EVAs or spacewalks with 16, over a total of 82 hours and 22 minutes (as at 2013). Astronauts that undertake an EVA or spacewalk usually have to use 70 to 110 tools to complete the tasks or fixes required on a spacecraft. Americans Jerry L. Ross and Franklin Chang-Diaz have been into space a record seven times each (as at 2013). The farthest an astronaut has travelled from Earth was 401,056 km (249,205 mi), by Jim Lovell, Jack Swigert, and Fred Haise, aboard Apollo 13. Throughout spaceflight history 18 astronauts have lost their lives during four tragic space flights. 11 other people have lost their lives training for spaceflight. In early space programs, trainee astronauts needed previous military jet test piloting and engineering experience. Today, high achieving students of engineering, biological science, physical science or mathematics can all make it. To become a NASA trainee, you are required to be a US citizen, you must pass a strict physical examination, have 20/20 vision, and good blood pressure. Once selected, NASA astronauts spend 20 months training in a variety of areas. To simulate spacewalks and test equipment astronauts often have to train underwater in swimming pools here on Earth. For more information about the everyday life of an astronaut living in space, see our astronaut video page.